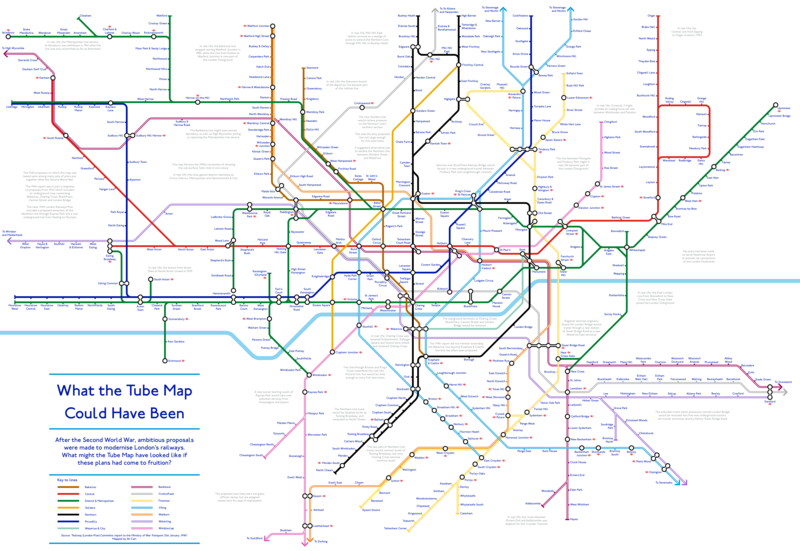 The map above shows what the Tube Map might have looked like had proposals from 1946 had been implemented. The plans are nothing if not ambitious, especially for a country that still had rationing in effect following the devastation of World War 2. The source for these plans was the Railway (London Plan) Committee: report to the Ministry of War Transport 21st January 1946. The Northern Heights Plan extending the Northern Line all the way to Bushey Heath. Metropolitan line going all the way Aylesbury and Central line going all the way to Ongar. No DLR or other similar rail projects in the Docklands. Embankment station still being called Charing Cross and the existence of Trafalgar Square and Strand stations. Many new stations including: Mount Pleasant, Ludgate Circus and Millbank. The continued existence of many closed stations including: Aldwych, Holborn Viaduct, South Acton, and Shoreditch. The Mainline terminals at Charing Cross, Blackfriars, Cannon Street and London Bridge would have been removed. Still no Bakerloo line extension south from Elephant and Castle.